First of all, anyone who followed the blog in the past will (hopefully) be glad to know, I'm back! Nerf have released the Stampede! One of the most expensive and complex Nerf blasters ever made. The Stampede is the first fully automatic clip fed Nerf blaster, the first Nerf gun to come with more than 2 clips and is probably the most anticipated product Nerf has ever created. 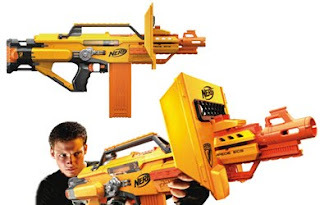 The blaster comes with one 6-dart clip, THREE 18-dart extended clips (it can also take 36-dart drum mags), a removable "shield" and a pop-out bi-pod/grip. Like the Nerf Vulcan/Havok Fire, the blaster uses a 6 D-type battery compartment for its power, which can easily take alternative batteries to produce higher rate of fire. Unlike the Nerf Vulcan, the Stampede is able to fire reliably from any angle, and is lighter and more maneuverable. Very, very big thanks to Sgnerf for all of this information. The best place to BUY the Stampede is at Play.com for £48.97. Keep checking here for more Stampede info as I come across it.